Long gone are the days when knitting or crochet was something you only saw old people doing in cars, trains and buses - everyone does it everywhere now! Knitting and crochet today as pastime, hobby or a way to make beautiful, unique things have exploded across the generations. At Blacker Yarns we have always made ourselves available to help customers: we don’t like telephone options, call centres or computerised answers and always prefer a personal approach when we answer queries. You may want us to help you choose the right yarn for the right pattern, or you may not be able to knit or crochet at all and want help on needle sizes, tension or technique. This page is designed to help with the basics. 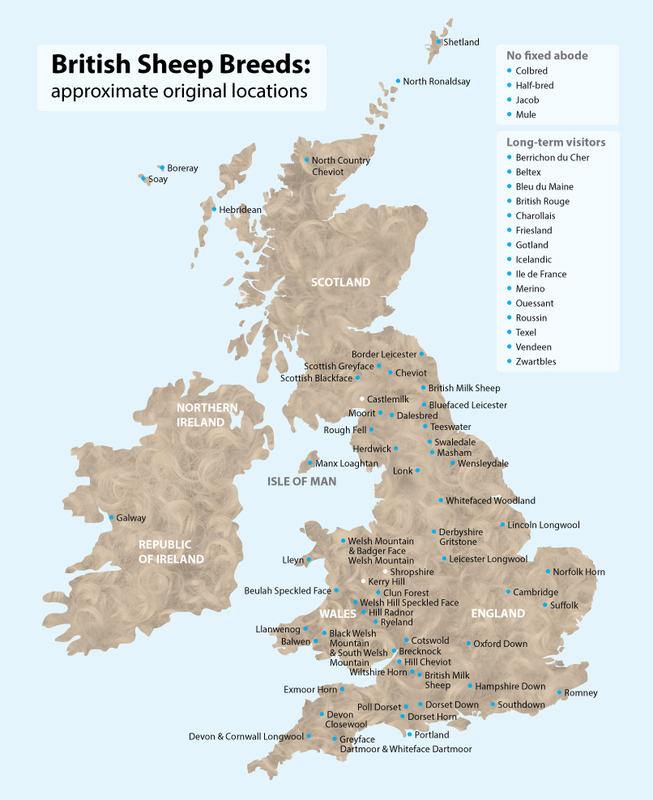 A map of sheep breed origins showing original locations of British breeds of sheep. Three helpful websites are mentioned in these files, which you can also reach direct from here: the Campaign for Wool, the Soil Association and Ravelry. We also have other downloads, some of which are mentioned in these files, where there is more detailed information. You will find these by going to the Natural Fibre Company and clicking on the Help and Advice box. To help customers curious about how various breeds relate to different parts of the UK, we have put together this map of sheep breed origins. More information about some of these breeds and the fleece they produce can be found in our Meet the Animals page while Sue's book, Pure Wool, goes into more detail on the yarn characteristics from 17 British breeds and provides appropriate knitting patterns to make the most of them. For more detailed information on a wider range of breed characteristics, see these sheep breed charts.